Definition of Totem Poles: What are totem poles and what are the meanings of Totem Poles? 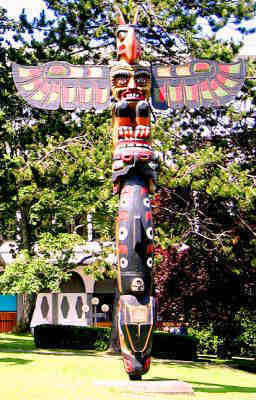 Native American Totem Poles or posts are sculptures carved into large tress by cultures of the indigenous peoples of the Pacific Northwest Coast of North America. Totem poles are carved and painted with symbols and totems or figures such as animals, that represent the emblems of clans or families and relates to their belief in Totemism. A totem is an emblem, such as an animal or plant, that is believed to have spiritual significance and watches over the family, clan, or tribe symbolizing their guardian spirit or helper refer to Totem Pole Art and Design. The word totem is derived from the Ojibwe (Chippewa) word 'odoodem' meaning "his kinship group". 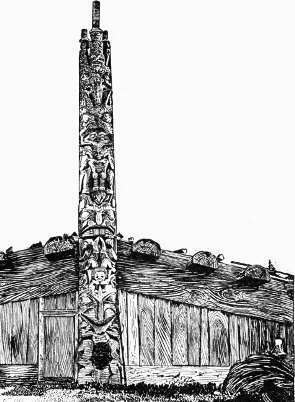 Totem Poles were not worshipped but they inspired respect.